Ruth Mary (Forkenbrock) Schuver Nelson, 87, of Liberty, MO, passed away August 21, 2018, at Liberty Hospital with family at her side. Visitation will begin at 9:30 am, Rosary at 10:30 am and Mass of Christian burial at 11:00 am, on Tuesday, August 28, at St. James Catholic Church, Liberty. Burial will follow in Resurrection Cemetery. In lieu of flowers, memorials are suggested to the St. James Catholic Church Building Fund. 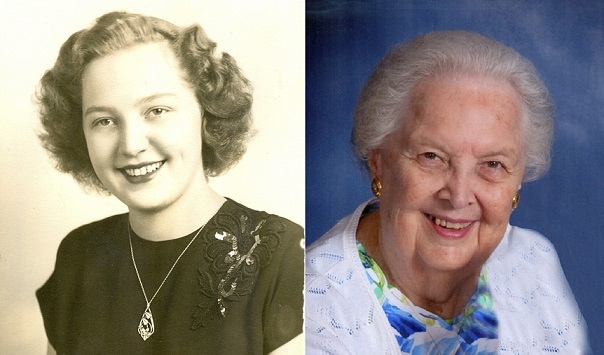 Ruth was born June 9, 1931, in Grandville, Iowa, the youngest of 11 children of Fred and Catherine (Diers) Forkenbrock. Along with her parents, Ruth was preceded in death by her first husband, Art Schuver; sons, Steven Schuver and Dave Schuver; seven brothers and two sisters. Ruth was a lifelong devout Catholic and a member of St. James parish and its Altar Society. She worked many years as a waitress and later retired from the Lathrop and Gage Law Firm at age 81. Survivors include her husband, Ted Nelson; children, Phil Schuver (Mark Waite), Michael Schuver (Hylah), Diane Swift (Jim), Debbie Zellner (Ed), Bruce Nelson and Todd Nelson; seven grandchildren, seven great grandchildren and two great-great grandchildren. She also leaves a sister, Rita Delperdang and many nieces and nephews. I am deeply saddened to learn of Ruth’ passing. I have fond memories of being in her house with Dave and Phil. I will miss you so much Aunt Ruth. My prayers and love are with all of my family, may angels comfort everyone. I forgot to include Mike in our message. My apologies.